Chelsea will not be signing defender Simon Kjaer in this window. That’s the word from Turkey, as reported by Goal this morning. Rumours linking Chelsea to the Fenerbahce ace have lead the Turkish club to deny the connection outright. 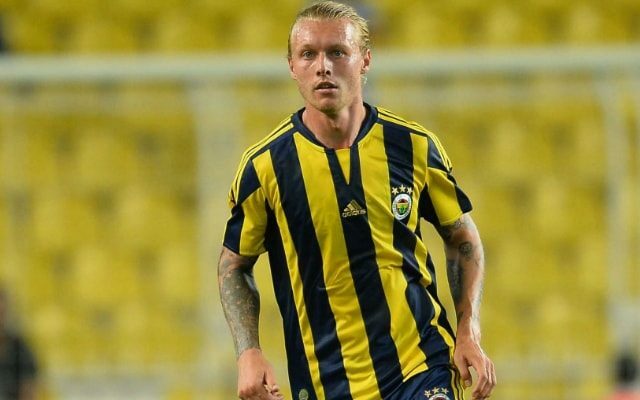 “A number of recent reports have falsely claimed that Chelsea have made an offer for our Danish player Simon Kjaer,” read an official Fenerbahce statement, published by Goal. “Fenerbahce have not received any offers whatsoever for Kjaer and any claims suggesting a transfer could take place are wrong. Kjaer is a happy and successful member of our team. It seemed a far fetched idea anyway, given Chelsea have just recalled loan star Nathan Ake to plug any gaps at the back, and the Blues also have Kurt Zouma fit again, having completed 90 minutes against Peterborough. Still the transfer rumour mill never stops, and this week it was the turn of Danish international Kjaer to be linked with Stamford Bridge. The 27-year-old has starred in Turkey since a move from Lille two summers ago. While a denial from a club never does much to ruin a good rumour, this one was pretty flimsy to begin with, and it looks highly unlikely Kjaer will be the man for Chelsea even if they do bring in a new face at the back this January. Chelsea are favorites to win the Premier League this season. Not all of today’s Turkish sports news is made-up nonsense. As reported by BBC Sport, Brazilian midfielder Sandro has signed a permanent deal with Antalyaspor, after completing a transfer from Queens Park Rangers.